This recipe is brought you by the glorious foods of the fall season. Bring on the squash! Butternut squash is one of my favorite fall foods. It's a little bit savory and a little bit sweet and pairs well with so many different flavors. It's also the perfect ingredient to add hearty richness to a meatless dish. This salad is a perfect example. This fall salad would make a filling lunch or a delicious meatless dinner. Typically I prefer my squash prepared on the more savory side, so in this recipe it is simply roasted with olive oil, salt, and pepper and is complimented by a few touches of sweetness from other ingredients in this salad. Dried cherries add a sweet and tart flavor to this salad and it gets a bit of spiciness from the red onions. 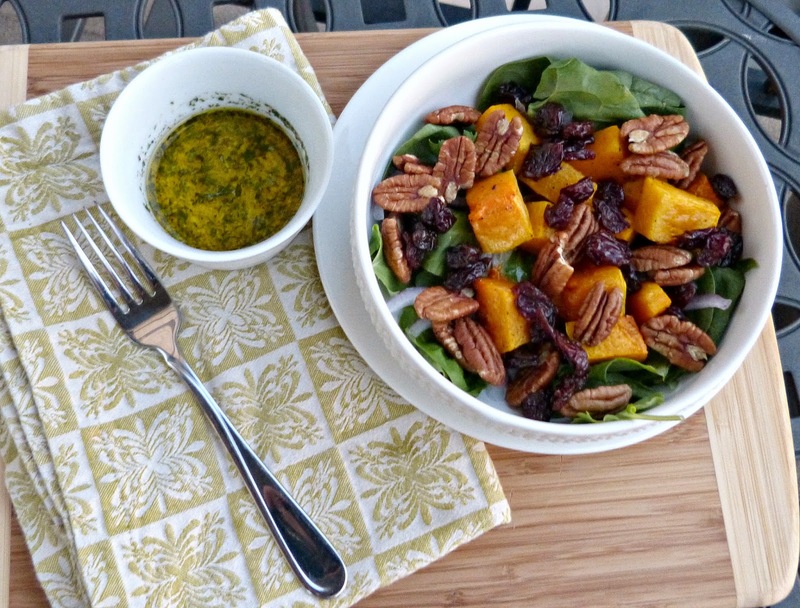 Toasted pecans add crunch and their nutty flavor pairs really nicely with the squash. It's all topped off with a sweet and spicy maple Dijon dressing. The combination of butternut squash and maple syrup is a classic fall flavor and this dressing really just rounds out the whole salad nicely. 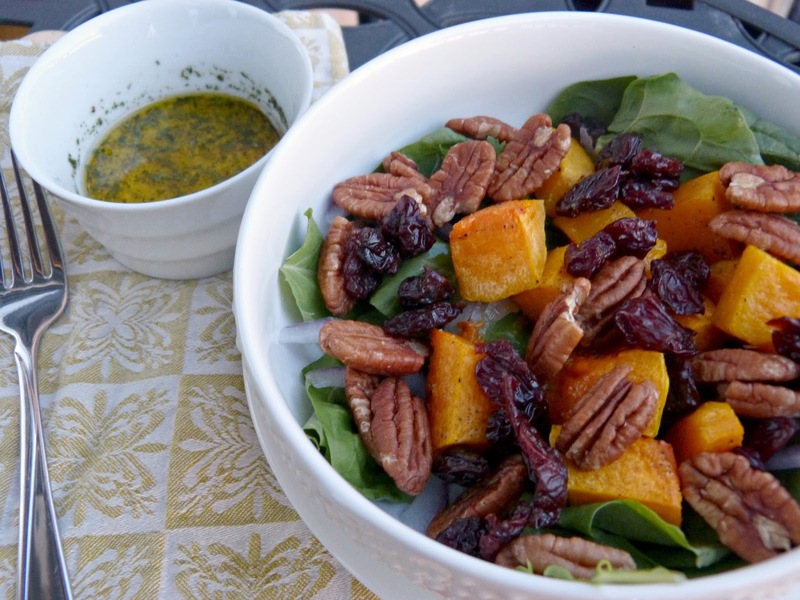 Arrange greens in a bowl and top with squash, onion, cherries, and pecans. Separately in a small bowl or carafe, whisk together olive oil and next 5 ingredients (through salt and pepper). Dress salad with desired amount of dressing. Cut the top and bottom off a medium butternut squash and use a sharp knife to carefully peel off the skin. Cut the squash in half lengthwise and use a spoon to scoop out the seeds inside. Discard seeds and membranes. Cut the squash into 1-inch chunks. In a large bowl, combine diced squash with 2 Tbs. olive oil and season with salt and pepper. Toss until well coated and then spread out on a large baking sheet. Roast for 25-30 minutes until squash begins to caramelize and is fork tender.